James Stroudley (1906-1985) was born and lived in London. 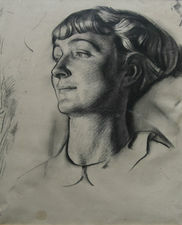 He studied at Clapham School of Art in 1923-27, then Royal College of Art in 1927-30, his teachers included William Rothenstein and Allan Gwynne-Jones. Stroudley was a Major Abbey Scholar in 1930-33 which gave him three years travelling in Italy. From here he was inspired by classic Italian painters, notably Giotto and Piero della Francesca. 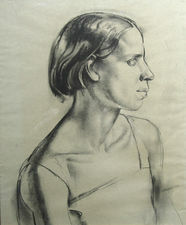 He became a fine figurative draughtsman, but his work was also influenced by the Cubists. He was a visiting lecturer at the Royal Academy Schools. Showed at RA, RBA (became a member in 1934), RE and elsewhere. Arthur Tooth and Son and Apollinaire Gallery gave him one man shows. 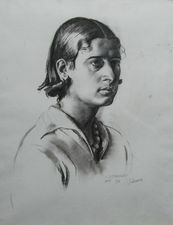 Public collections in Bradford, Brighton, Herbert Art Gallery in Coventry and Rochdale hold examples of his work.